What really ensures a student's success? Is it wise counsel? Do the academic courses really mean that much? Realistically, I feel that all of those have importance but on the other hand, a college student really needs good coffee and a nice place to study. Yeah, I know that's probably not totally true (though I needed those two things). But nonetheless thousands of students sip gallons of mediocre joe and study in boring drab rooms, and many of them still fall short of amazing. If only more amazing coffeehouses would come to the aid of the students! With that cry deep in my heart, I embarked to examine a coffeehouse known to supply NYU students with decent nectar and beautiful ambiance, a place called Think Coffee. Sure I had heard not as glamorous feedback as well, but the place had some merit for at least a look. Think possesses quite the unusual look for a Manhattan business (at least in my experience) in that it had a large stoop with plants placed on either side and a snazzy awning to boot. Inside, I fell in love with their high ceilings (with tremendous lighting), various environments of space and their fantastic array of furniture. Most of the coffee hails from Porto Rico Importing Company, a coffee company that's been around for some time in the area but has not made any significant waves recently. 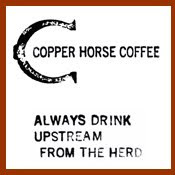 But to my delight, Think Coffee also brews two self-roasted Cup of Excellence coffees on drip. Not in a gambling mood, I went for the Nicaraguan COE via drip. 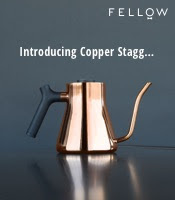 The brew presented light floral notes, tastes of strawberries and an overall nice somberness to it that made for a nice afternoon cup (wouldn't really pack the punch necessary for a morning pot). The espresso, pulled short, smacked of bittersweet cocoa, some nutmeg and a very full taste; good overall shots. The tea is free leaf of various kinds and Think also serves wine and beer (on tap!). Meandering off afterwards, I greatly envied the many students cuddled up with their Calculus and their Aristotle in the warm embrace of Think Coffee. Not only do they have many great coffeehouses around Manhattan to choose from, but they also have a great one on their doorsetp. 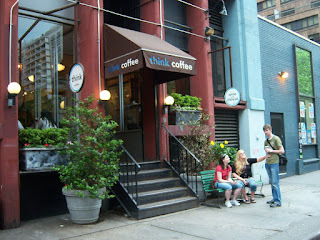 In my opinion, a stop below Washington Square Park deserves a stop at Think Coffee. LOL, I think coffee ensures not just student's success, but for us workers as well.